For this card I chose to use the beautiful Vintage Holly Branches stamps. I think is is a wonderful Statement stamp. It is also fun to color. I used 4 different shades of green pencil on the leaves alone. 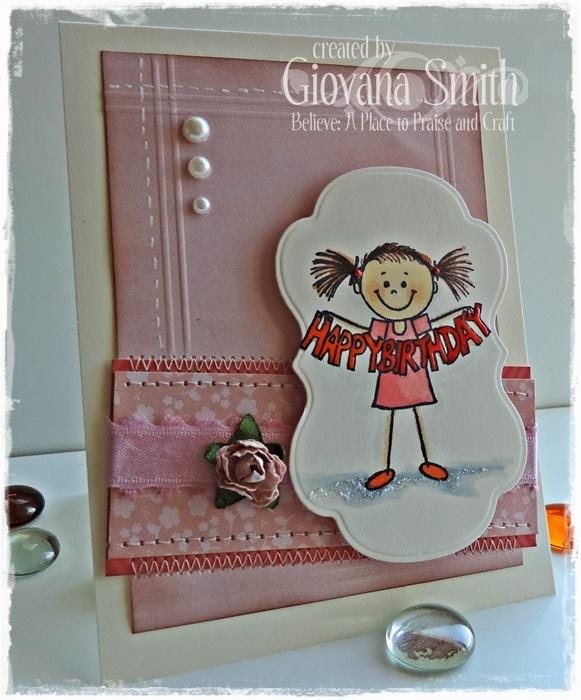 I used some papers with a muted color to them to continue the vintage feel of the stamp and some buttons as simple embellishments. I really want the image to be the focal point for this card. 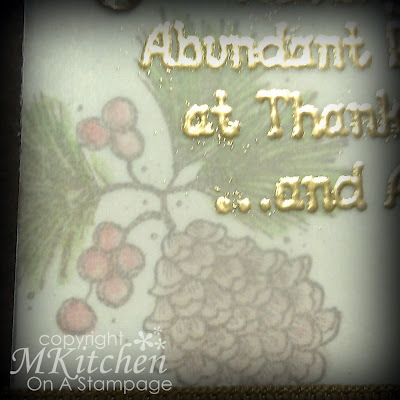 You may be seeing this stamp one more time before Christmas used as a background pattern. As I was writing this post I was inspired by the image and so I will not be able to stop myself. Once a card idea comes to mind, it stays with me until I sit down and bring it to life. So watch for it on upcoming Fridays. Until then, lets get busy and make some Christmas cards. It's Thanksgiving! I hope you're having a wonderful day and that you are spending it with your family and loved ones. 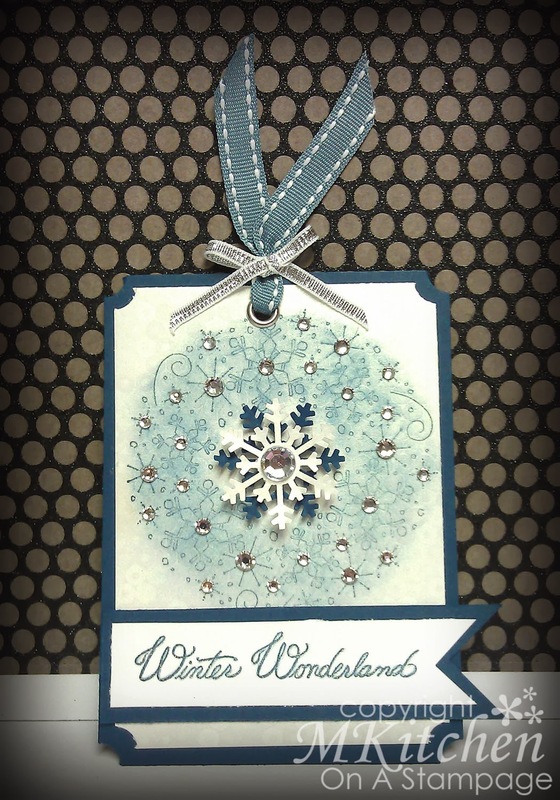 :) I've got another video tutorial for you this week and the technique is called FROSTED IMAGES and is just perfect for a holiday tag! I'll be back with another tutorial NEXT WEEK with another fun technique--PAPER PIECING! I'm trying to keep it quick and simple for the holidays, but I think you'll agree that all of these simple techniques pack a huge WOW factor! It's my Inspiration day here at Great Impressions! Today my inspiration is a little Spring and a fond memory. in after dinner during the years we lived in Oklahoma. that when winter is over, Spring isn't that far off. 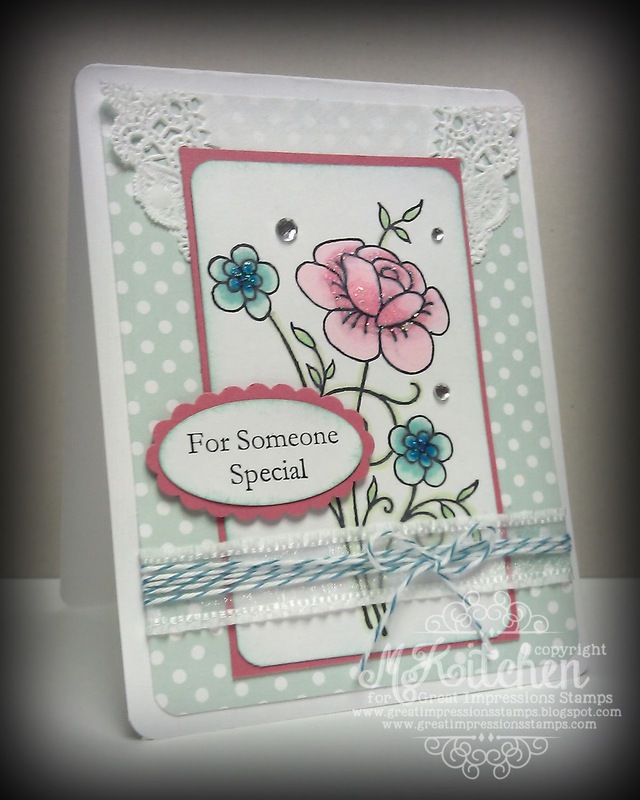 This fun stamp is: Flower Flyer G327 . You can stop by the Great Impressions Store for the stamp and browse the pages of stamps that are offered. I colored the image up using Prismacolor Pencils and a little blending with a turpenoid solution. Thanks for stopping by, check back every day here at the Great Impressions Blog for inspiration and don't forget to join in this months challenge. Hello friends, Giovana here today with another Clean and Simple Christmas card. 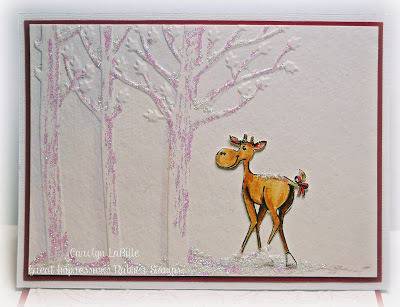 For this project I used Magical Deer image, I used the embossing resist technique. 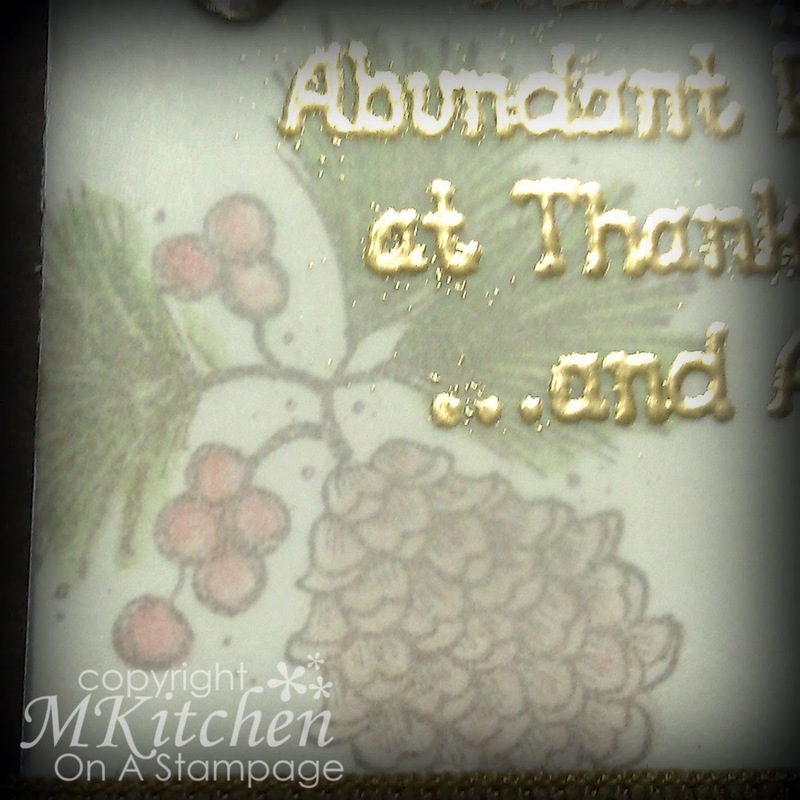 I stamped the image in Versamark ink, added Clear embossing powder and sponged the image with Distress Inks to reveal the image. Added a gold snowflake and pearls. The sentiment is a sticker. 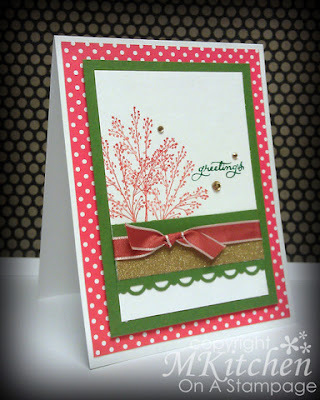 My girls call my card style sparkly-pop and today's card is definitely a text book case for that style. I knew that I wanted to pop the petals on the Poinsettias and Berries stamp the moment I saw it and boy does it look great popped. The bottom Poinsettia three layers and the top has five. 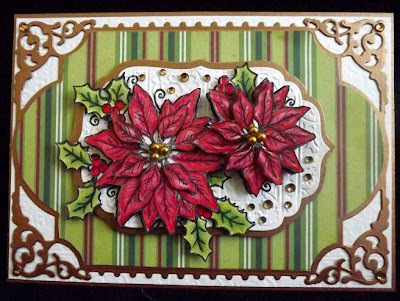 I dry embossed the background and filled in some of the blank spots with adhesive gems. 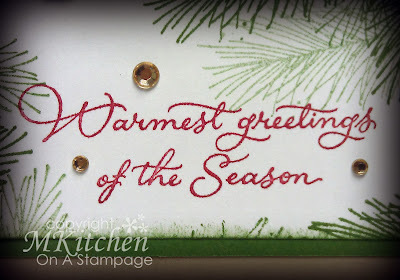 I love the traditional green and red striped paper that I found in my stash and used a some dies to really make this a lavish card. This is definitely a card that will have to either be mailed in a bubble envelope or hand delivered. It's just one week until Thanksgiving in the US and I think that we sometimes skip over this important holiday to get to Christmas. But we NEED to give thanks, and so I've got a card today that pays homage to this much needed holiday. Products used: C31 Pine Cone Sprig, C384 Abundant Blessings. I'll be back again next week with another video tutorial utilizing the FROSTED IMAGE technique. 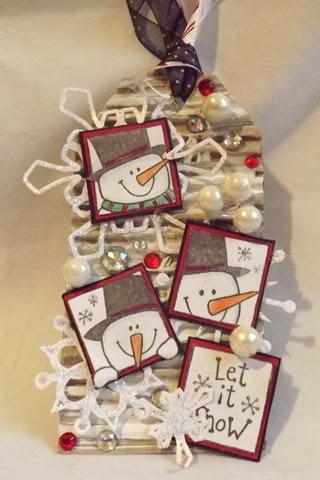 I'll be making another holiday tag, so you'll want to grab the supplies and get a head start on making one, too! Thanks so much for stopping by to check out my weekly creation! 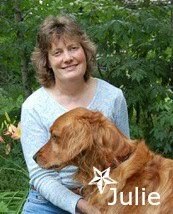 I hope that you take some time to create a card that expresses thanks and that you make sure to give Thanksgiving a good part of your heart and life. HUGS and thankful stamping, friends! Happy Tuesday! Today my card project is all about the first frost of the season. We've already had over a dozen frosty mornings up here in Minnesota and I love to see everything encased in white and clear "ice" Snow should be coming soon! silver dots on each of the corners then added sentiment stickers. 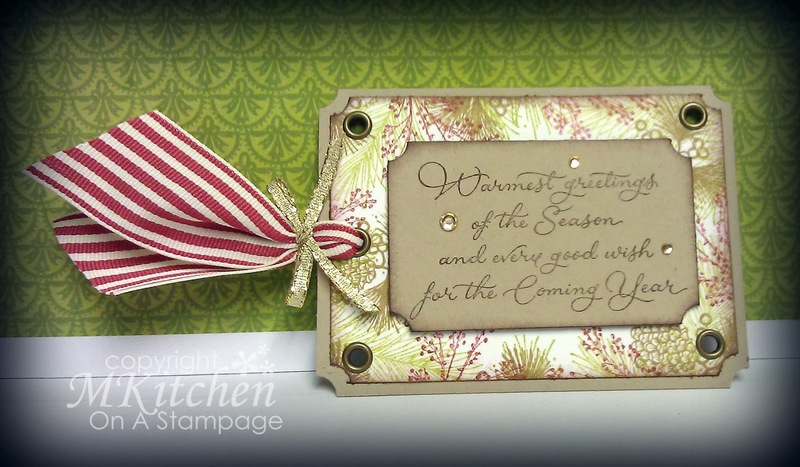 current challenge: "Holiday card or tag". ~ You do not have to use a Great Impressions Stamp, but if you do, leave us a comment with your entry number and we will send you a coupon code good for 20% off any $25 or more order! Limit of one code per person each month. Order must be $25 before the discount. We love to see what you create with our stamps! For this project I used "Christmas Bell Swag" image, the sentiment is part of Jingle image. The main image was stamped in Memento Tuxedo Black on White Cardstock, colored it with Copic Markers, then I die-cut, embossed and stenciled with Labels Fourteen Nestabilities Dies. Then, I added StarDust Stickles to the ribbon and the bells. I added the image to my card base with Dimensionals. For the sentiment, I covered the little jingle with a piece of Washi Tape and stamped only the sentiment in Love Letter Ink. 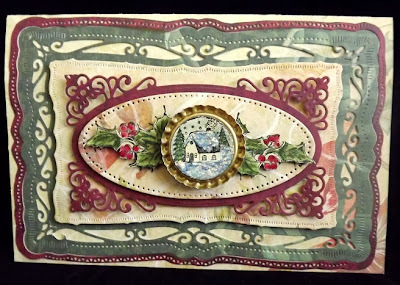 Finally I added pieces of Patterned Paper to the left side of the card, this paper is from "Twelve Days of Christmas" by Graphic 45. 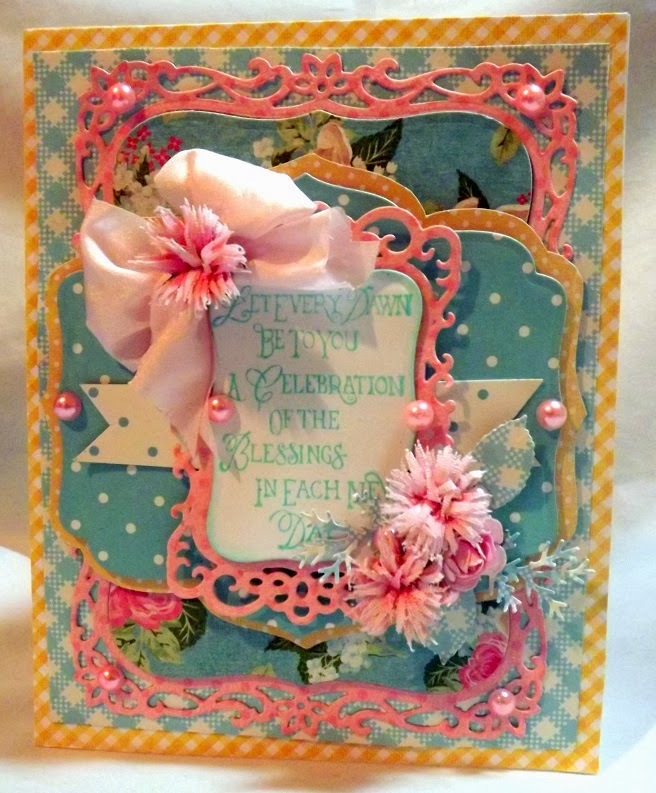 Products used: J110 Flower Bouquet, A109 For Someone Special, Bundle of Joy Girl Paper. Happy birthday, Jenny! We hope you had a wonderful day! THANK YOU for all you do to help us at here at Great Impressions! Hi, friends! It's another Thursday and I've got a new video tutorial to share with you!!! 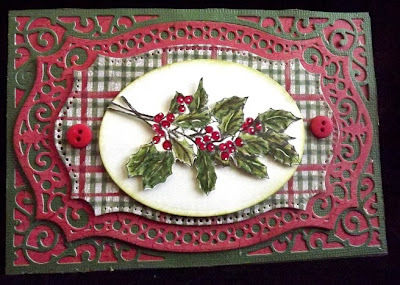 This week's technique is called COLLAGE STAMPING and I've decided to make a holiday tag to go along with this particular technique. Thanks so much for stopping by to take a peek at this week's video! 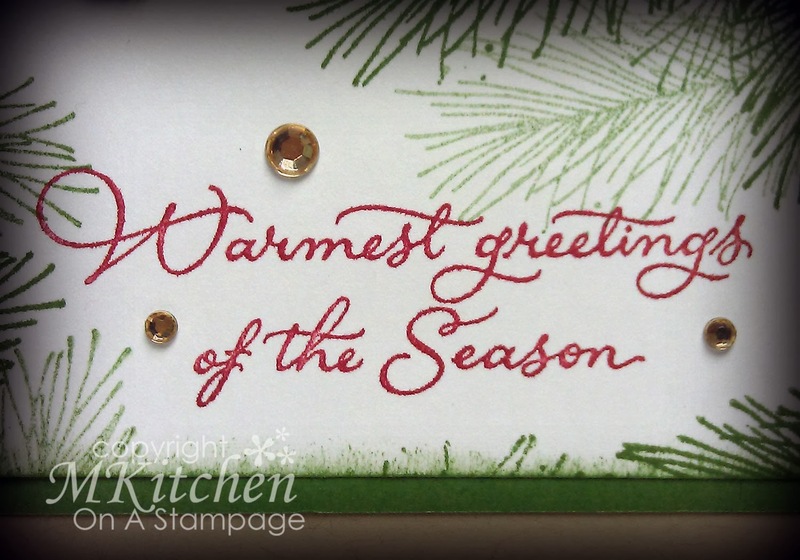 I hope you enjoy trying your hand at collage stamping and that you grab the supplies for the next technique we'll be learning--FROSTED IMAGE! Happy Tuesday! I hope you all are having a great start to the week. Up here in Minnesota it's COLD! What a fun week we have had with "Guess the Christmas Carol" contest, visit the Great Impressions website to check out the list of winners, maybe you are one of them!! 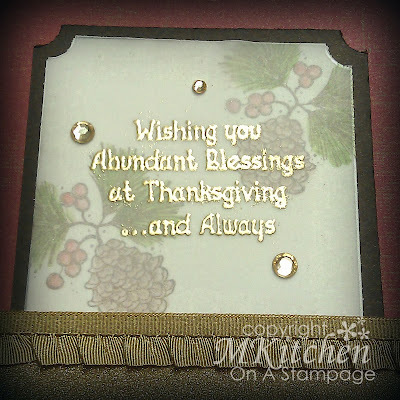 Today I have a Thanksgiving tag to share with you. I am loving all of what is left of the Fall foliage. I'm loving the intense orange, yellow, green and red hues that are out at the moment. I can't imagine a Fall without a "cornucopia" of colors and a brisk cold wind. off the tag with a seambinding ribbon and the whole tag is backed with kraft paper. I hope you liked my cornucopia of colors used for my project. blog and stop back daily for new inspiration from our design team. Hello friends!! Hope you are starting a great week! What a fun week we have had with "Guess the Christmas Carol" contest, scroll down to check out the list of winners, maybe you are one of them!! So today, I have a winter card for you. 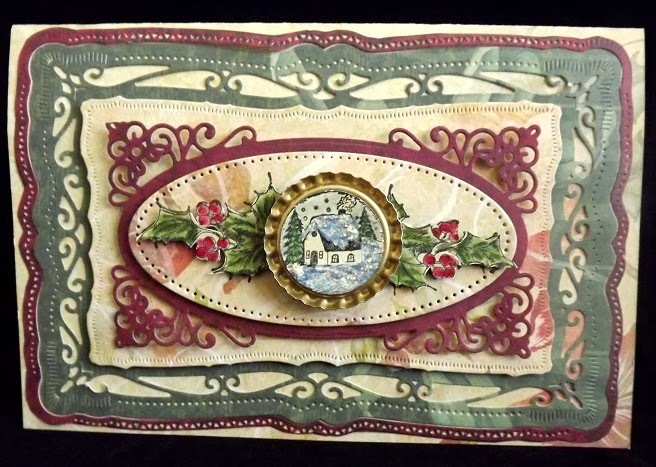 This card remind me my friend's house, she lives in a beautiful cabin in the mountains of WA State, I used to live close to her until I moved to another mountain location LOL, and during Winter time, it looks just like this image, isn't it pretty? Card details: I stamped the image on White Cardstock in Memento Tuxedo Black and colored it with Copic and Spectrum Noir Markers. I added White Opal Liquid Pearls to the trees and crushed glass to the ground to create a snow area. The Design Team and I would like to thank you for making Christmas Carol week such a blast! We loved reading all your sweet and sometimes humorous comments! We had a total of 269 comments that made us all smile from ear to ear! Let's take another look at all the pretty cards AND the name of the carol that inspired each card. Cheryl - "Santa Claus is Coming to Town"
Mynnette - "Oh, Christmas Tree"
Mary Anne - "I Wish it Could be Christmas Every Day"
Each of our winners will win two stamps of their choice from our newest on-line Holiday collection!! with the names of your two choices and your home address. I will get those out in plenty of time to start those holiday cards! Wishing you a very crafty week! Hey, everyone! 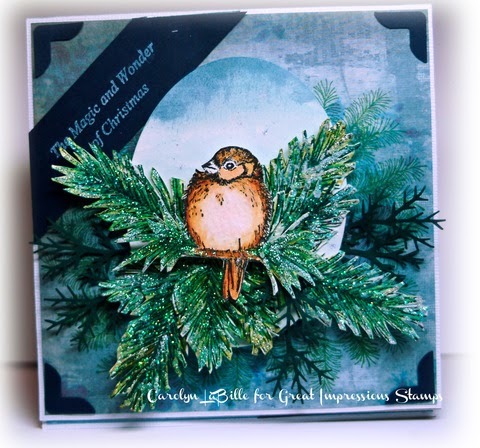 It's Cindy Lawrence here, and I'm excited to be guest designing for Great Impressions Stamps today. A little bit about me for those who may not know who I am... I live in southern NH with my incredibly supportive husband, Jim. We have four children, three awesome boys (ages 24, 22, & 16) and our sweet baby girl. (Okay, she's 13...I'm in denial.) I've worked in the crafty/artsy industry for about 18 years. In the early days, I was a very successful Stampin' Up demonstrator, and made the transition into the "rest of the big ol' crafty world" when I was a part of the Splitcoast Dirty Dozen back in 2008. Since then, I have been blessed to be a part of many design teams, and currently have the best job in the entire world as a Copic Certification Instructor. I get to color and travel for a living, and have met some of the most amazing, sweet people on the planet. What a privilege and an honor! I think crafty people are the nicest people, don't you? I am totally impressed with the variety and selection of stamps in the Great Impressions store. I had such fun playing with the stamps I was sent! This week, Great Impressions is hosting a fun Guess the Christmas Carol challenge each day, complete with fun prizes for the winner! Can you guess what my carol is? All you need to do is comment here on this post with your guess, and we'll choose a random winner from the correct guesses. 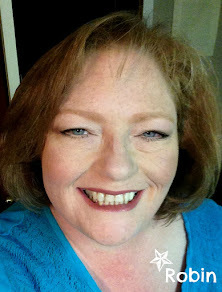 Be sure to hop on over to my blog, The Creative Closet, to leave a comment there as well to increase your chances of winning. The stamps I chose to work with are Stickable Stamps, which are precision-cut, cling rubber stamps. I love that they have the image printed right on them; so you can see exactly where you're stamping. They are really fabulous! 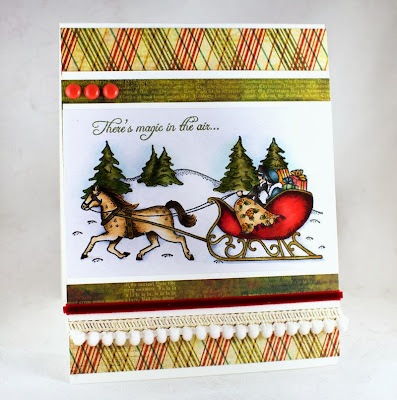 My card was made with the gorgeous Sleigh Ride stamp, as well as the Magic in the Air sentiment. Aren't they just beautiful? I had such fun coloring that sleigh image! I stamped it in Memento Tuxedo Black ink on X-Press It Blending Card, and colored it with Copic markers. 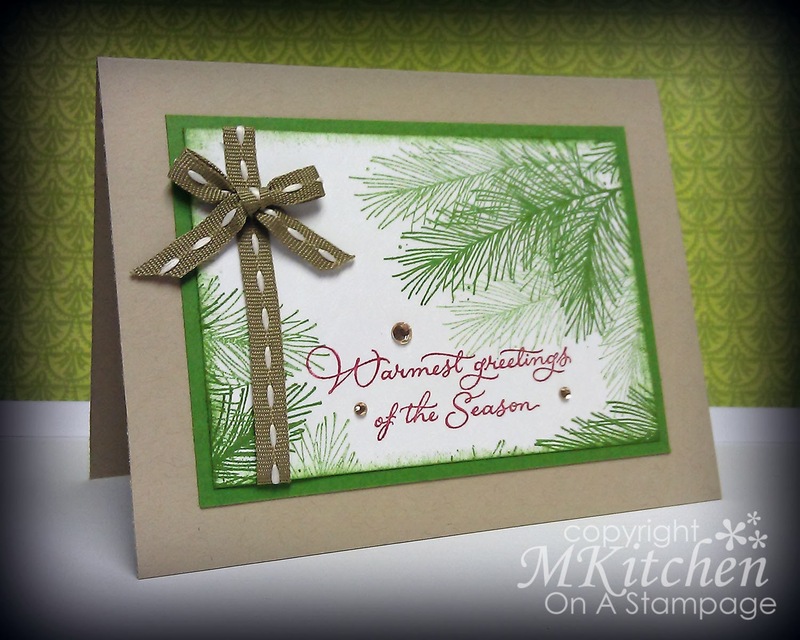 I stamped the sentiment in Memento Olive Grove ink. The card base is is a smooth white, and the pretty patterned papers are from an oldie-but-goodie, Basic Grey's Jovial 6x6 paper pad. I added a row of pom pom trim, red velvet trim, and a trio of red enamel dots to finish off the details. Inside, I added a strip of patterned paper, and stamped the image in Memento Pistachio ink. 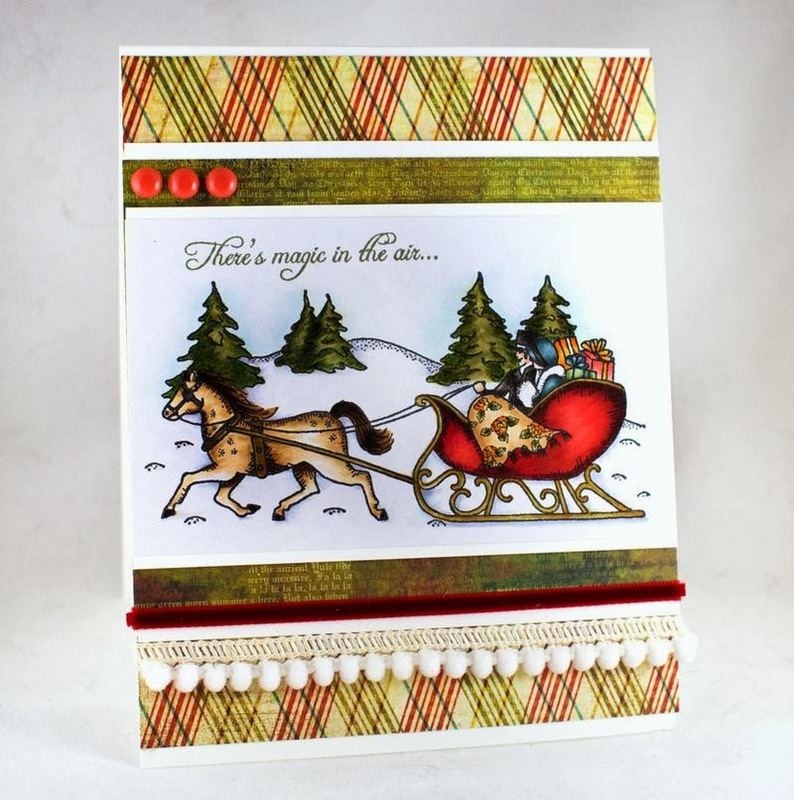 I do so love that Sleigh Ride image! Remember, there is a great sale going on right now through tomorrow! Just enter the code Merry on the shopping cart page to save 15% storewide. How's that for a sweet deal?! Thanks so much for visiting today, friends! Products used: F249 Warmest Greetings, G140 Pine Branch. No hints because I hope it's pretty obvious what my carol is! For another chance to win, leave a comment HERE on my personal blog as well!!! Thanks so much for stopping by and I hope you join me again next Thursday for another video tutorial! The technique will be COLLAGE STAMPING! 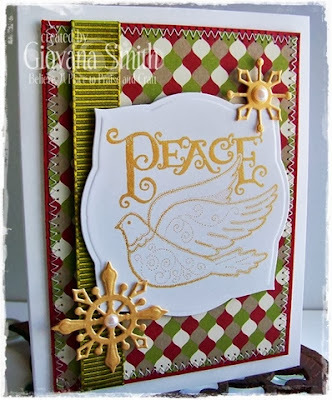 It's Christmas Carol week at Great Impressions Stamps! Read all about the details here. Did I mention that prizes will be involved?! This is Cheryl from Shestamps and I’m here to share my Christmas carol inspired card (and an extra project)! I think you will be able to figure this one out. I left a couple of clues. 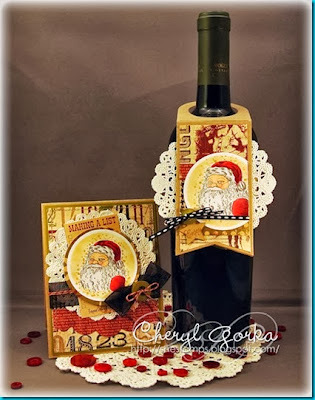 For both of my projects I used Saint Nicholas (E659) from Great Impressions Stamps. I just love this image. He looks great colored but you can also leave him uncolored for another great look. Here’s a closer look at St. Nick. I just want to pinch his cheek. Here is a final peek at both my projects. Don’t forget to leave your guess as to which Christmas carol inspired my card. 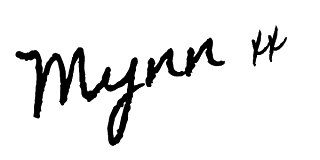 You can leave your guess on this post and on my blog for two chances to win! Check out all the great Christmas carol inspired projects by the DT at the Great Impressions Stamps blog all week. It's Christmas Carol week here at Great Impressions Stamps! Carolyn here with my holiday card inspired by a Christmas Carol. You can add your guess on my blog as well. I would love to see you there too. I hope you find time to participate this week!!! We have so many fun creations for you. I altered the stamp a little to fit my card theme. Hope you like it! 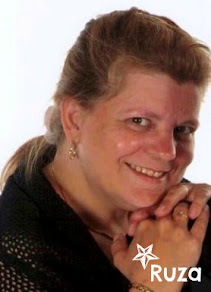 Don't forget to leave your guess for today in the comment section and on my blog as well. We've got some fun prizes! Guess the Christmas Carol!! and your chance to win. 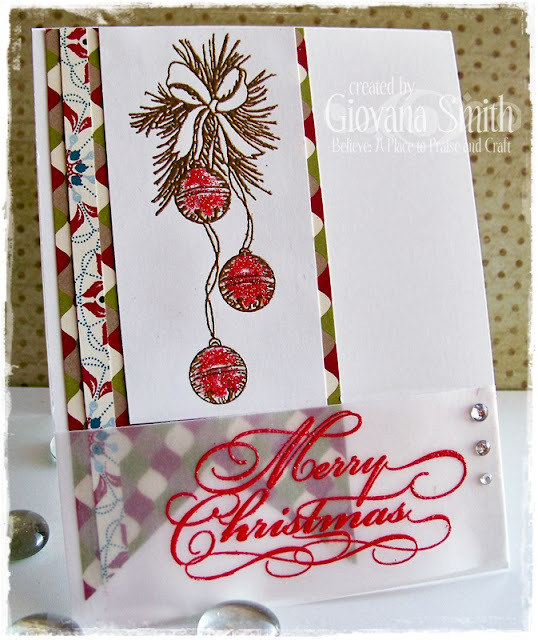 Giovana here with my holiday card inspired by a Christmas Carol. Yikes! I can't believe it is November already! For some reason the holidays always sneak up on me. Our November challenge will get your holiday Mojo on, but more about that later. We have two runners up to announce in no particular order. sharing your amazing work with us! Click on "Challenge Rules and Badges" on top and grab your badge for your sidebar! We would love it if you linked it right back here to us. Our November Challenge starts today! Think Thanksgiving, Hanukkah, Christmas, New Years. We have made it even easier to enter our challenges. Using keyword - GISMC11 in the title so we can find you and leave a little comment love. and we will send you a coupon code for 20% off a $25 order!!! To view all of our challenge rules just click on the "Challenge Rules & Badges" tab above. with their take on the challenge. 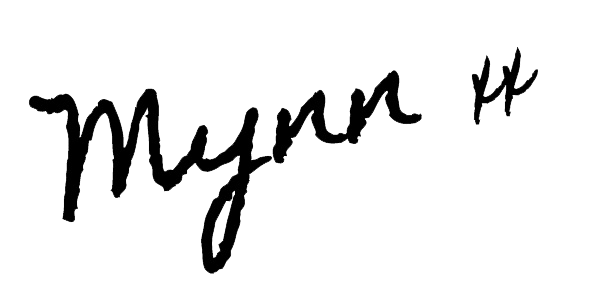 Welcome Carolyn! We are so happy you are here! 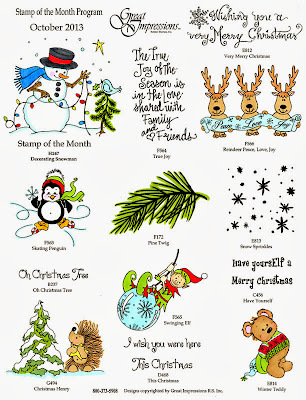 Looking for a deal on some holiday stamps? shop at our on-line store and receive 15% off your order! "Guess the Christmas Carol" game with Giovana for prizes!! I'm popping in today with plenty of news to share! First, our brand spankin' new holiday release is hot off the presses. It's time to get thinking about those holiday cards! Today is also a day of changes. DT members Erin and Monica have completed their terms with us. It was a joy to work with them and we wish them all the best in their new endeavors! 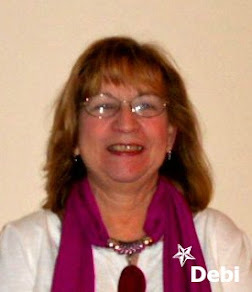 This coming week you will meet our newest design team member Carolyn! Just wait till you see the mad coloring skills this girl has! To get you in a holiday mood, beginning Monday and all week long we will be playing our "Guess the Christmas Carol" game for stamping prizes!! Each day one of the Design Team members will show you a holiday card and you can guess which Christmas Carol inspired their card. You may leave a comment each day here and/or on the Design Team members blog with your guess. Winners will be chosen from all the correct answers. Did I forget to mention that we have a very special guest playing along with us next Saturday? Cindy Lawrence designing for us!! tells me just what a wonderful lady she is! I will be back tomorrow with our October challenge winners and a new challenge! 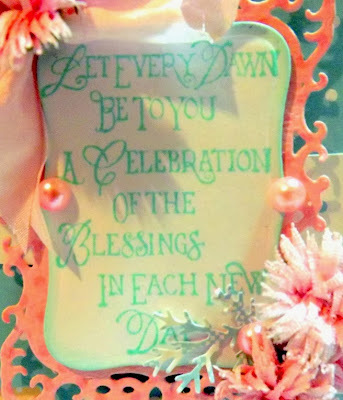 After a month of Halloween cards I am ready for something a little different so today I thought I would bring you a shabby chic sentiment card. 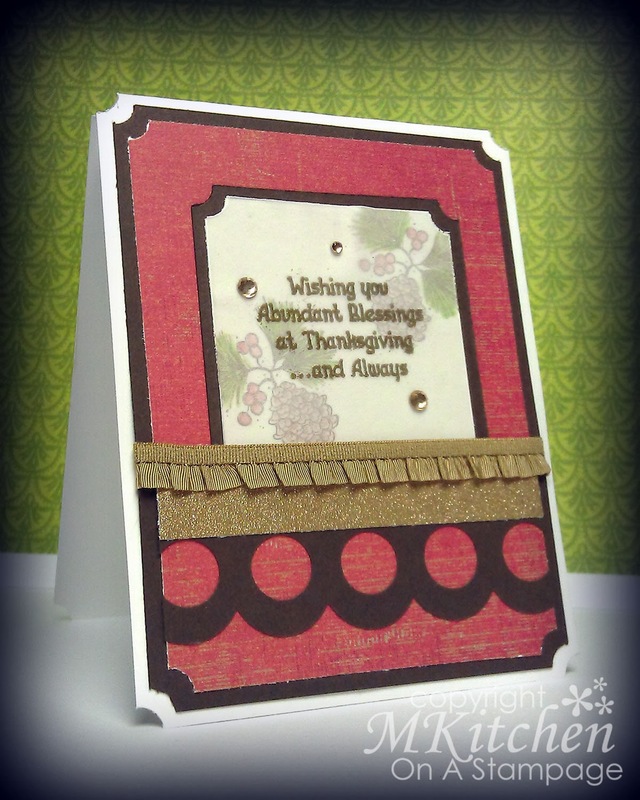 The New Day sentiment is wonderful for Thanksgiving or anytime of the year. Since I didn't have lots of detail in my stamp I used an extra bit of color and patterns in my design papers as well as lots of layers. Here is a close up of the lovely New Day sentiment stamped in aqua to match the design paper. Blessings to all of you on this day and everyday until I meet with you again.